Well, Naomie Harris is in good company, as not knowing what is going on with Bond 25 has seemingly been the prevailing state of everyone following 2015’s Spectre. Seriously, it isn’t entirely surprising that Naomie Harris isn’t yet sure if Eve Moneypenny will be in the film. These are still early days, with the film not scheduled to hit theaters until fall 2019. The script is currently in development, with Danny Boyle planning to begin shooting Bond 25 at the end of the year, so there is still plenty of time for Moneypenny to come aboard. Based on her comments on The Graham Norton Show (via Digital Spy) Naomie Harris sounds up for reprising her role. One has to imagine that Eve Moneypenny will play a role in Bond 25. The Moneypenny character has been a part of the James Bond mythos since the franchise’s beginning. Even though she was not introduced in the Daniel Craig Bond continuity until Skyfall, Naomie Harris’ Moneypenny actually gets a bit of backstory as a field agent before she becomes M’s secretary at the British Secret Service. 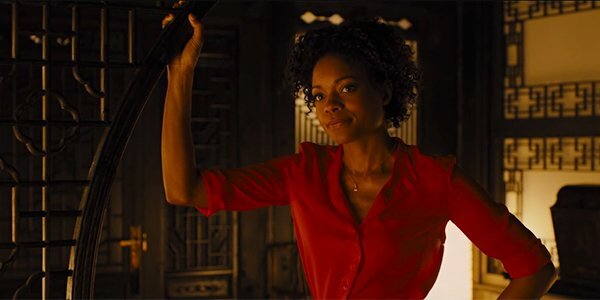 We don’t know for sure that the series will be rebooting after Bond 25, but assuming it does, it would be nice to see Naomie Harris’ version of Moneypenny one more time. The cast for Bond 25 is just one of many questions we have about the popular spy series. With this confirmed to be Daniel Craig’s last outing as 007, there are a lot of questions about where the franchise can go from here. Most of those questions center around who will be cast in the iconic role and whether or not it will be someone other than a white dude. There have been calls for Bond to be a non-white actor, specifically Idris Elba, or even a woman, with people weighing in on both sides of the fence. While we wait to see if she returns to the James Bond franchise, you can see Naomie Harris on the big screen this weekend opposite The Rock in the video game adaptation Rampage. Bond 25 is currently scheduled to hit theaters on November 8, 2019.